Symbogen has become the face of a new wave of medical technology, based on the use of parasites to keep humanity healthy. However, as Sal – the amnesiac survivor of a car accident – will soon learn, our parasitic saviours are started to feel restless. 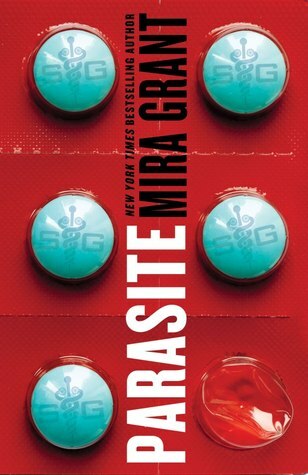 I feel the need to start this post with a caveat: although I have the Newsflesh series and plan to read it at some point, Parasite is actually the first Mira Grant novel I’ve read. This might make my take on it different to those who are more familiar with her work. I also mostly enjoyed the characterisation of Sal and her boyfriend Nathan. They both felt like fleshed out individuals, and their relationship felt real to me. At times felt a little too fleshed out for someone who only had 6 years of her post-accident life to refer back to, which made for some unnecessary moments of disconnect between her experiences and her reactions. But this is a mostly minor quibble. Unfortunately, I can’t say that all the other characters received the same care. In fact, they all seem to blend into one another after a while, which was my biggest disappointment with the book. Given the detail that was put into other aspects of the story, this weak characterisation of secondary characters seemed like a weird oversight. As for the final twist? Yeah, sorry. It isn’t so much a ‘twist’ as it is a ‘thing that was obvious, right from the very beginning.’ In fact, it was so bloody obvious that I’m surprised it wasn’t revealed earlier, so that the story could develop around it. It probably would have picked up the pace of the story a bit. Damn it. This isn’t sounding so positive any more, is it? I liked Parasite. I did! I’m really looking forward to the next installment, Symbiot. Perhaps though, when it comes down to it, I liked it despite its flaws, not because it lacked them.